Mindfulness, a therapeutic practice with its roots in meditation, is increasingly being promoted as a means of achieving a range of health benefits—both physical and psychological. Essentially, mindfulness is a state of being, achieved by focusing attention on the present moment, observing, accepting and then letting go of any emerging thoughts, feelings, and bodily sensations. The methods by which attention can be focused on the present are various—including breathing exercises, meditation, observation, yoga, and art practices such as drawing, and origami. The poem below, written by Rumi, the 13th century Persian poet and scholar, is often used by mindfulness practitioners to express this central idea of noticing, acknowledging and letting go of thoughts and feelings in the body. The benefits of practising mindfulness seem to be that this intense focus on being in the present moment helps to connect us with our physiological and emotional responses to the world inside and around us, instead of our habitual way of going into ‘autopilot’ to cope with the many stresses and demands we face in our daily lives. In turn, this helps us to have the freedom to make more choices about how we respond to the world, rather than being ruled by old patterns. There have, however, been criticisms of the upsurge in the way mindfulness is being promoted as a therapeutic practice. Key amongst these is that for some people (especially those who have encountered trauma) mindfulness practices can put them in touch with very difficult feelings that become overwhelming to cope with alone. 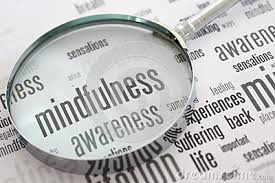 Another criticism is that mindfulness is being promoted by employers and health providers because it is a much cheaper intervention, compared to other therapies such as counselling or CBT. As with any kind of therapy, it is important to find a good practitioner to work with, and also to keep in mind that any intervention that presents itself as a ‘one size fits all’ needs to be viewed with a very careful critical eye. The following links provide more information about mindfulness—what it can offer as well as its limitations.